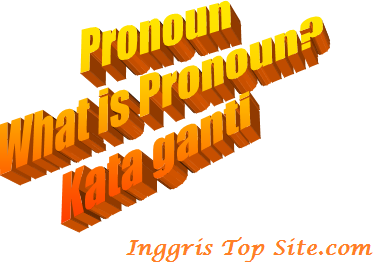 Ø Personal pronoun yang menggantikan subjek,, yaitu: I, you, we, they, he she dan it. Kata ganti ini berkedudukan sebagai subjek dalam kalimat. a. I go to school every day except Sunday. g. I have a cat. It has a beautiful fur. Ø Personal pronoun yang menggantikan Objek,, yaitu: me, you, us, them, him, her dan it. Kata ganti ini berkedudukan sebagai objek dalam kalimat. a. Do you love me? Pronoun yang menerangkan milik/kepunyaan. Pronoun ini digunakan sebelum noun. Yaitu: my, your, our, their, his, her, its. a. Those are my books. b. Can I borrow your computer? c. What is our National Anthem? d. I forget to bring their homework. e. Anita has a boy friend. His nose is pointed. f. Rio likes her way of saying. Pronoun ini digunakan untuk menjelaskan kepunyaan/kepemilikan. Misalnya: mine, yours, ours, theirs, his, hers, its. a. This netbook is mine. b. That car is yours. c. These calculators are ours. Misalnya: myself, yourself, ourselves, themselves, himself, herself, itself. c. We must introspect ourselves. e. He regrets himself for making mistake. f. She praises herself for what she has reached. g. The cat scratches itself. Demikian penjelasan mengenai Pronoun yang dapat penulis sajikan. Semoga bermanfaat bagi pembaca. Maturnuwun.